I sometimes wonder if autumn forgets to visit the British Isles — we seem to go from sun hats to knitted scarves in a matter of weeks and the shops are already well-stocked with mince pies. Crazy, right? And while the summer weather challenges our skin, the colder weather and shorter days can challenge us physically, mentally AND emotionally. 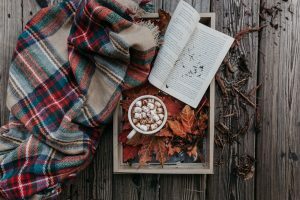 Luckily there are plenty of simple self care solutions we can use to help stave off the winter blues, especially if we get started right now, before the sunlight disappears completely! The wind, the rain, the central heating jacked right up…the cooler seasons do a number on your skin leaving it red, dry and chapped. Not a look that goes with your LBD and party shoes. If you want to keep your summer glow well into the party season, you need to start protecting it now. The most important weapon in your winter beauty arsenal is a good moisturiser. You want something that is light and packed with soothing oils, like the range from Lola’s Apothecary. Remember to exfoliate regularly to remove dead skin cells and help your moisturiser penetrate your skin properly. Prevention is always better than cure though, so avoid winter skin damage in the first place by covering your skin as much as possible whenever you’re out in the elements. A soft scarf worn high to cover your ears, your neck and the lower part of your face will keep you cosy and keep your skin soft. And don’t forget the sun protection. Just because it’s chilly out there doesn’t mean those UV rays aren’t dangerous. Dig out your sun cream and unleash your inner Italian by wearing your sunglasses all year round to protect the delicate skin around your eye area from the low winter sun. You get up for work and it’s dark. You come home from work, still dark. Even the cheeriest person can be challenged by the lack of daylight at this time of year. The knowledge that it won’t get any better until March doesn’t help. No wonder so many people report SAD symptoms in the winter months. One of the best ways to save your smile is to take your cue from the world around you; as nature prepares for a period of rest and renewal, so can you. If you want to curl up in bed at 8.30pm with a cosy blanket and good book, do it! If you want to skip the third party of the week and stay in with a bowl of chunky veg soup, do it! We naturally slow down a little at this time of year and a few more hours of rest and relaxation in your week will do you the world of good. That said, it’s important to take advantage of any daylight you can get, so don’t retreat to your bed too often! Set aside time each day to do something relaxing that you enjoy; journaling, yoga, meditation, a coffee with friends. By far the best thing you can do is wrap up warm and take a brisk walk outdoors in the middle of the day — the exercise will get your endorphins going and bring your smile back. It’s happened to us all; you pop your feet into your winter boots and forget about all about them. No one’s going to see them until spring anyway, right? Which is fine, until you realise your open-toed sandals are the perfect shoe to wear with your favourite party dress. Oops! Your feet work hard all year round so it’s worth treating them with kindness this winter even if the outside world only catches the occasional glimpse. Besides, there’s something so cheery about spotting a beautiful, brightly painted toenail popping out of the bedcovers on a cold wintry morning. A regular pedicure and lots of moisture at home will keep your feet in great condition — exactly what you need when you’re trekking the streets looking for the perfect Christmas gift or dancing the night away at a Halloween party. This can be a trying time of year for your muscles; the stress of Christmas prep starts earlier each year, as do the extra social engagements, and to top it off the cold weather tends to make us hunch over, tensing our muscles and leaving us feeling tired and sore. If you can’t reduce the stress in your life (if only it were that easy! ), you can at least reduce the impact it has on your muscles. Again yoga can be a great addition to your daily schedule — start the day with a sun salutation pose for a great stretch and dose of irony. And if you’re sitting at a desk all day, be sure to take regular breaks to keep your muscles loose. For the ultimate sore muscle treat, pop along to the salon for a restorative massage to help your muscles relax and release any tension they’re holding on to. Just the thing before you hit the high street with your Santa list!